For those of you who’ve been reading my blog for a while, you’ve probably noticed the improved photos since January. My lovely husband surprised me with a DSLR camera, something that I’ve always wanted since my film SLR stopped working years ago. The new camera spurred me to take a photography class through UT Austin’s informal classes, as well as read some photo blogs and books. I latched on to the idea of trying high dynamic range (HDR) photography after seeing HDR photos in a variety of places. I know that professional photographers have mixed feelings about HDR, but for us amateurs it can really help bring out detail in photos that we would not otherwise capture. When we traveled to my husband’s family farm in Iowa over this summer, I knew I’d have the perfect subjects for HDR photos. The farm is over 100 years old, the farm house was built in 1927 and my father-in-law has a variety of old Ford tractors and old farm implements on display. See timstractors.com for more information on how he restores the tractors. For the photos below, I used my big tripod, 5 stops for the HDR (-2, -1, 0, 1, 2), and Photomatix essentials to process the photo series. I tried to not go crazy with special effects. 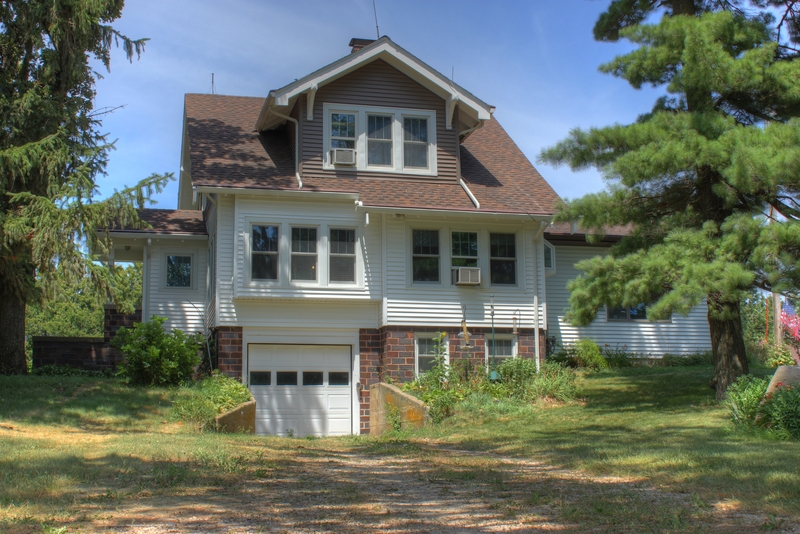 The farm house, built in 1927. 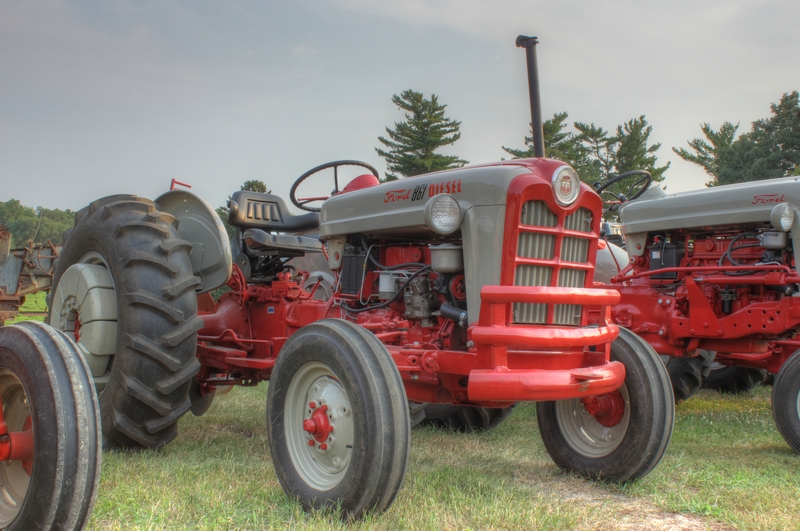 One of the many Ford tractors brought back to its former glory by my father-in-law. 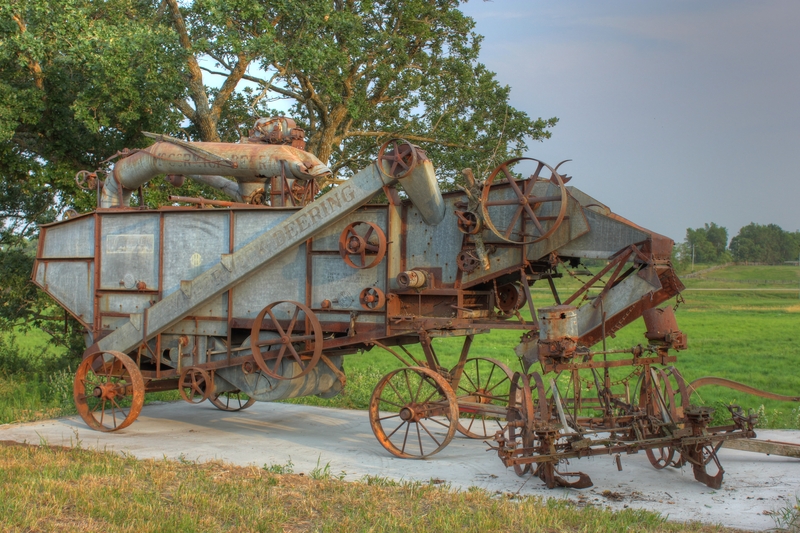 An old thresher, a farm implement that separates grain from the stalk and the husk. 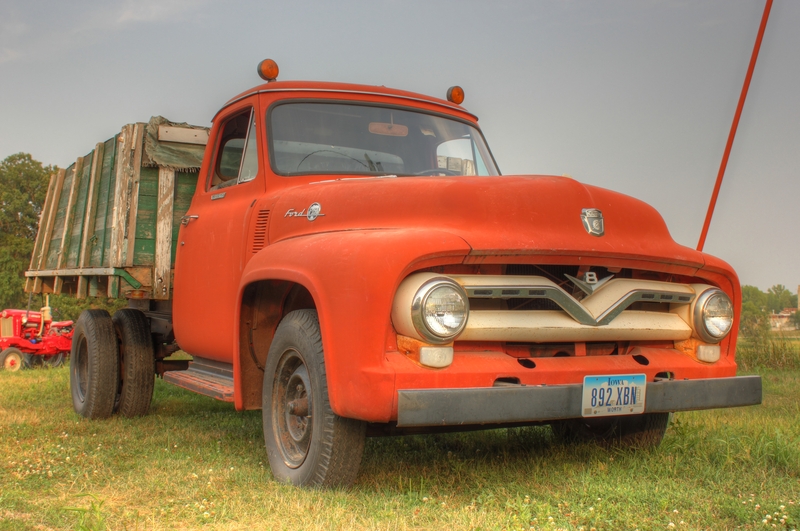 An old Ford truck parked on the farm. I picked up a collage frame and had a few photos printed to give to my father-in-law. I hope he likes it! 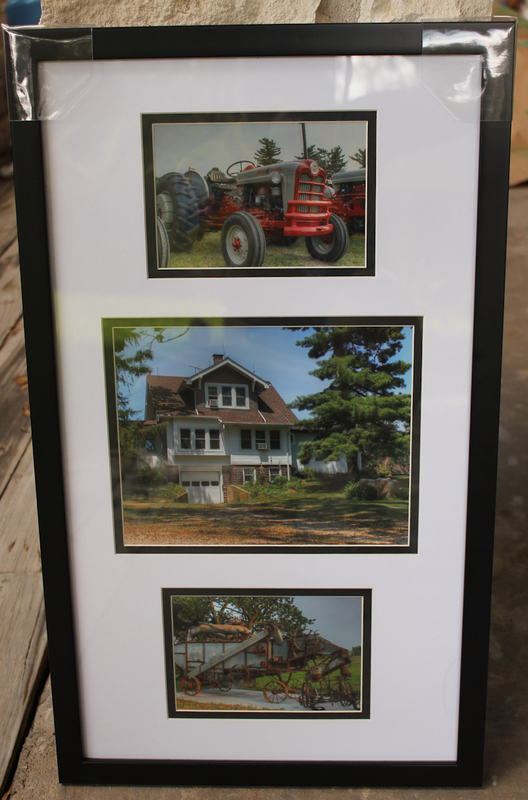 HDR photos of the farm ready to be gifted. This work by Laura Feeney is licensed under a Creative Commons Attribution-NonCommercial-ShareAlike 3.0 Unported License. We’ve been eating salad often the last few weeks. Mainly because we go out during the week and eat way too much and have to make up for it by having salad for dinner during the week. 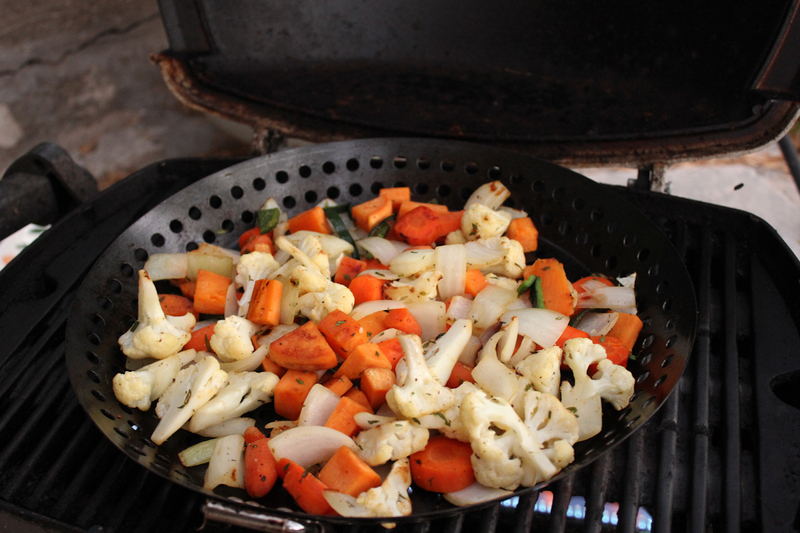 This week we decided to do grilled vegetables on top of a bed of roasted cabbage. I used sweet vegetables so that we could toss the salad with either a balsamic vinegar or some chipotle infused olive oil. Chop all vegetables. The sweet potatoes and the carrots take the longest to cook, so keep the slices thin. I like to slice the poblano thin. The cabbage should be sliced into thin ribbons. 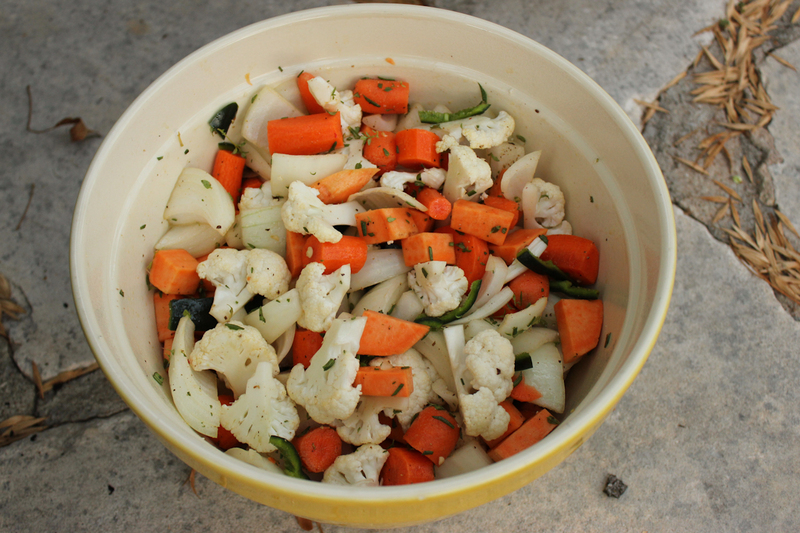 Toss the vegetables with a bit of olive oil and your spices. I used thyme and chopped rosemary from our garden, sea salt, and cracked black pepper. 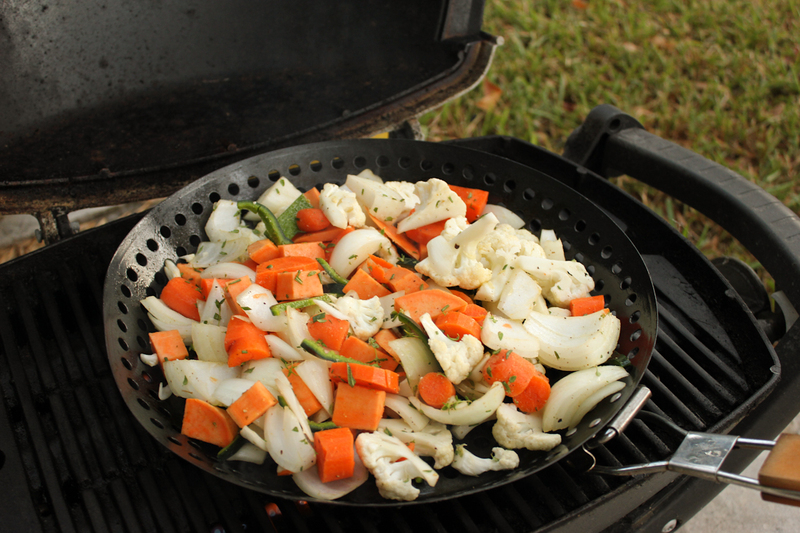 Oil a grill pan and cook the vegetable mixture over a low heat. This probably takes 20 – 30 minutes. While the vegetables are cooking, prepare the cabbage. 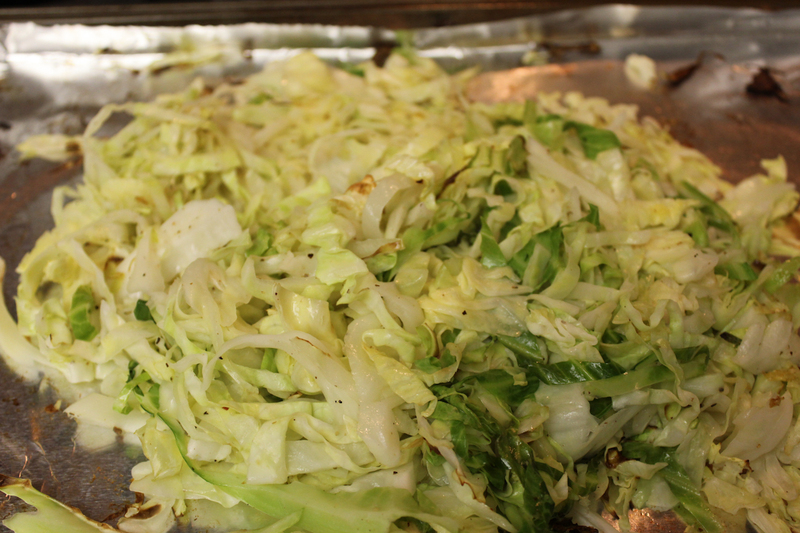 Toss the thinly sliced cabbage with olive oil, salt, and pepper. 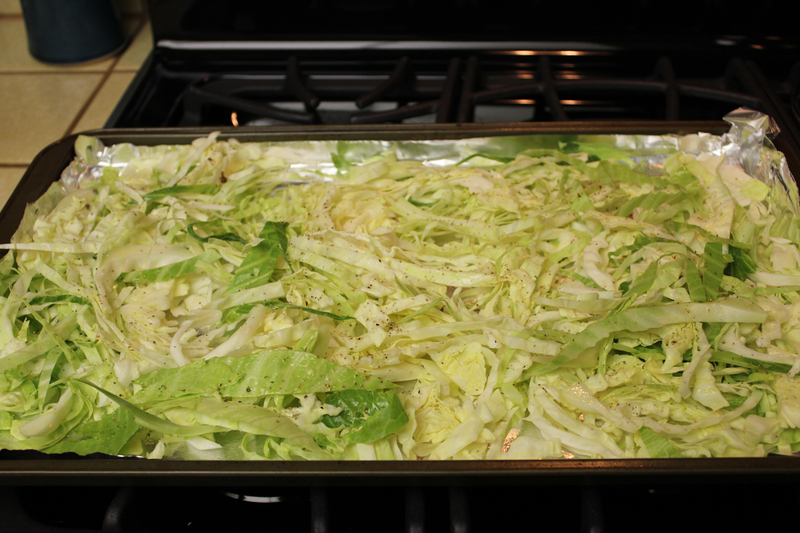 I usually just spread it out on a foil lined baking pan and use my oil sprayer to give the cabbage a light coat of oil. Roast the cabbage at 400 degrees. Stir it when the cabbage around the edges of the pan starts to brown. You want the cabbage to be uniformly cooked throughout. The total cooking time is about 15 minutes. Serve the vegetables over a bed of cabbage. Each person can season their vegetables as desired. We tossed our vegetables with balsamic vinegars and olive oils on different nights: red apple balsamic, chipotle olive oil, and fig balsamic. 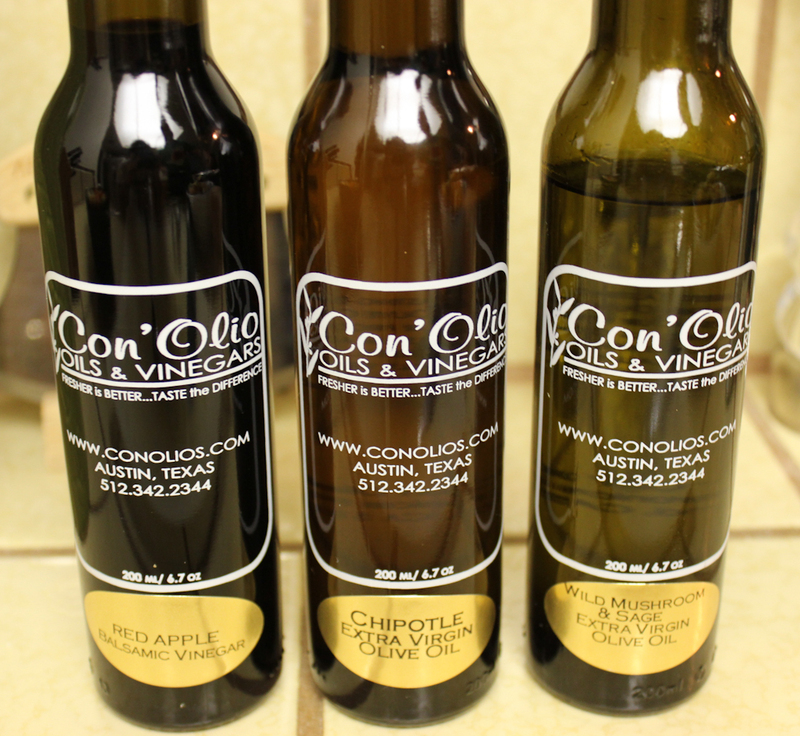 The red apple balsamic and chipotle olive oil were both from Con Olio Oils and Vinegars here in Austin. The fig balsamic I made myself earlier this year. If you don’t top your dish with cheese like my husband does, then this makes a nice vegan dinner. Every time I’ve walked into our new kitchen during the late afternoon / early evening with its west facing windows, I think to myself “it’s time to make sun screens.” Well, I finally got around to it so now the sun doesn’t blind us and we have improved energy efficiency, which is important in sunny and hot Texas. Because the built-in screens for our windows only cover the part of the window that opens, I had to create new screen frames for the windows, rather than just simply using the screen frame that was there. Converting existing screen frames into sun screens is much easier, something I’ve done before as well. Ugh, the sun shines right through the kitchen window on the west side of the house! Screen that blocks 80 or 90% of sunlight. It’s ok, you’ll still be able to see out just fine. 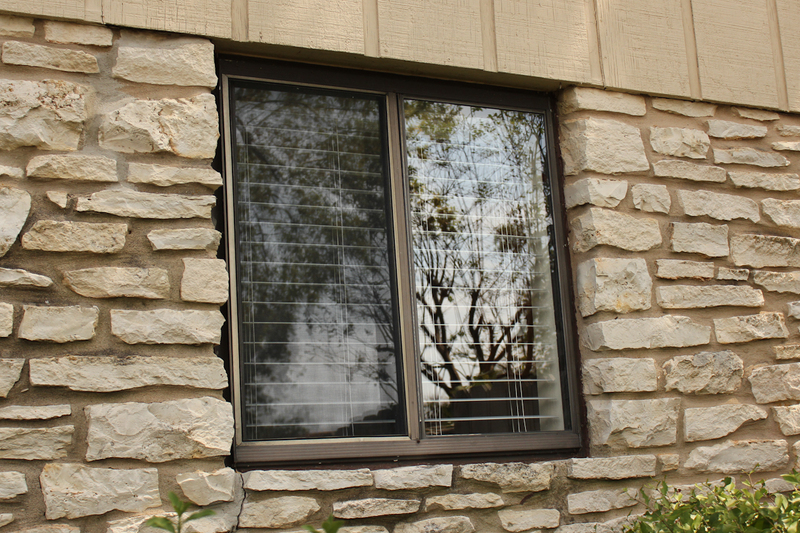 Measure your window to determine what size to make the screen frame. 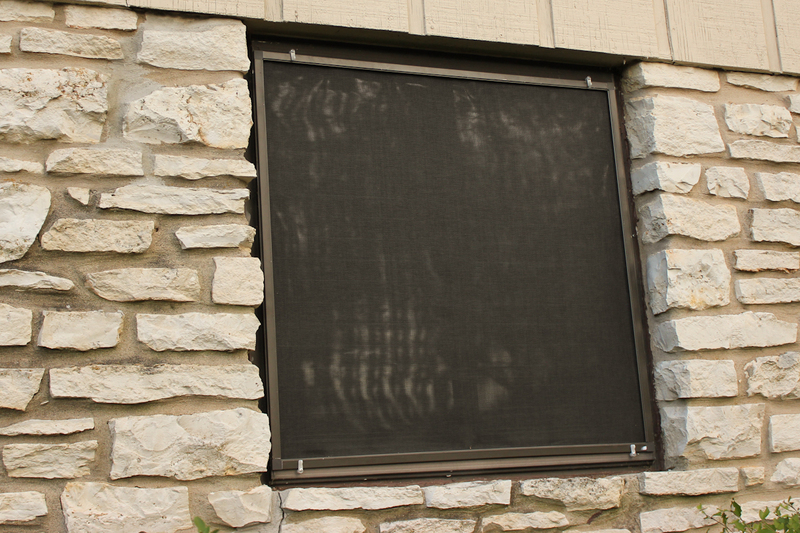 Make sure it will cover the window, but leave room to hang the screen using your chosen method. 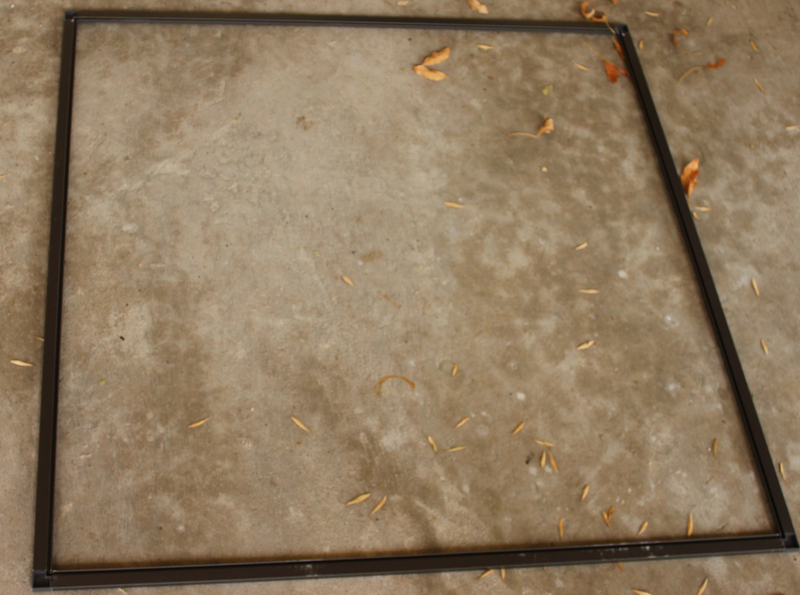 Factoring in the screen corners, cut the metal frame pieces to size. My screen corners added 3/4″ to each side of my screen, so I had to subtract 1.5″ from each side of my screen frame so that it would be the appropriate size. After cutting four pieces, assemble them with the screen corners. Then, cut a piece of screen to fit over the frame, leaving at least an inch or more on each side. 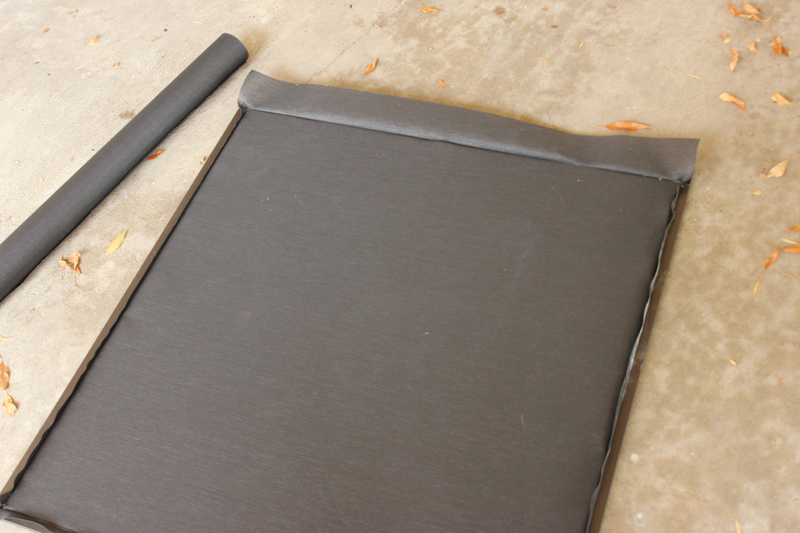 Lay the screen over the side of the frame that has the channel for the spline. The roller tool has one end that is narrow and another end that’s wider with a groove. 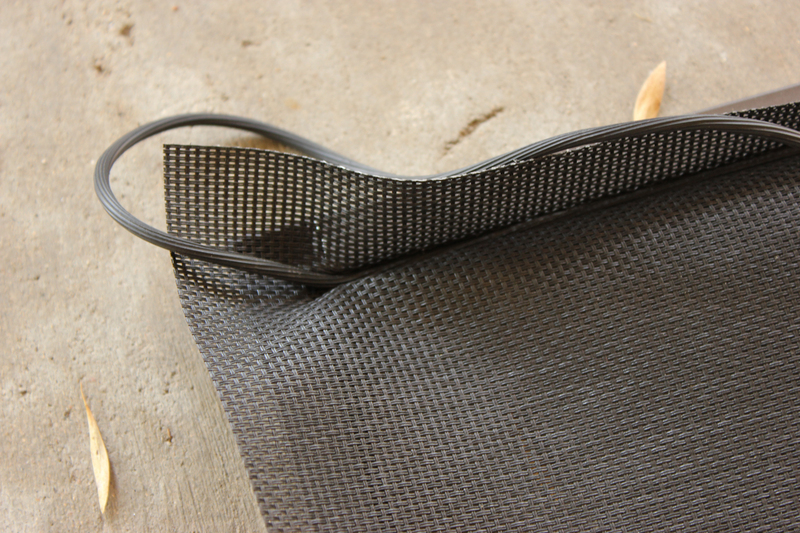 The narrow side is used to push the screen down into the channel before forcing in the spline. This helps you make sure the screen doesn’t get ripples and is positioned correctly. 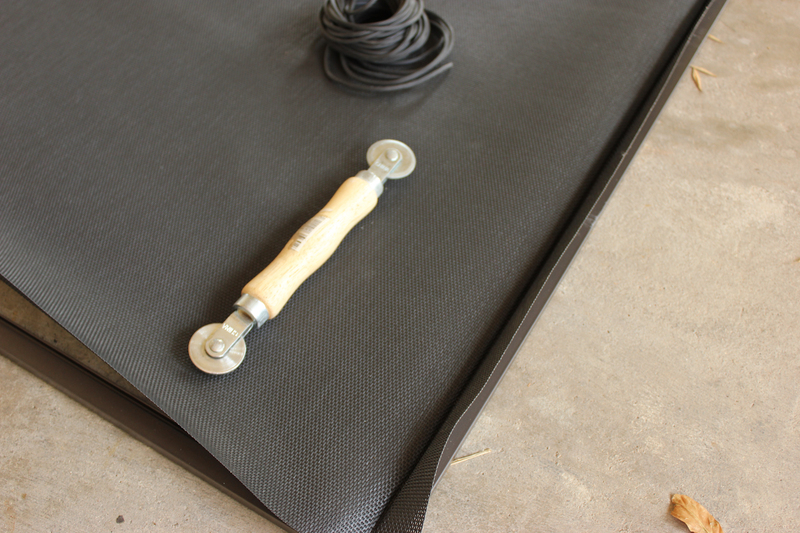 Use the roller to push the screen down into the frame before using the spline. 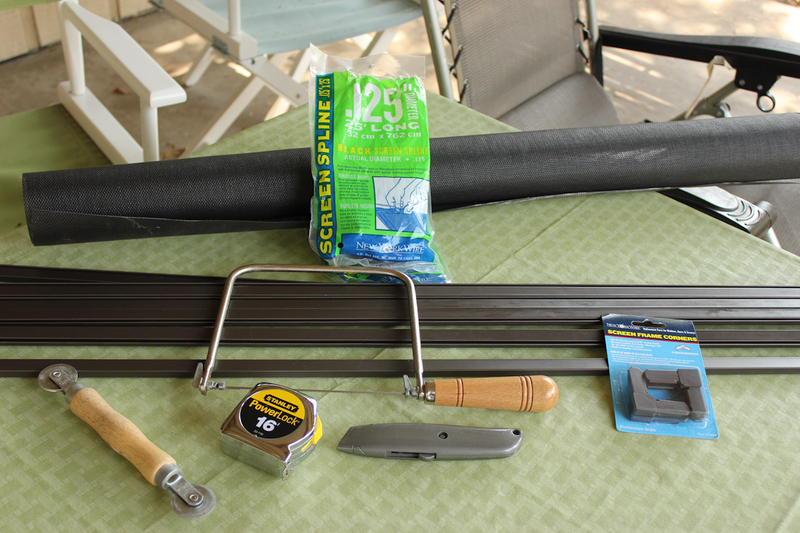 Next, use the other side of the roller to push down the spline into the channel, starting at one corner. This is where it helps to have the thinnest spline that will work for the frame. Spline in the channel of one side of the frame. I don’t worry about cutting the spline at each corner, I just make the turn and keep going. Make sure to hold the screen fairly taut while rolling in the spline, which can take some force. It helps to have two people for this part, especially if it’s the first time you’ve tried making a screen. Once you’re finished, use the box cutter to cut the excess screen off, close to the frame. Be careful that you don’t cut your new screen! I position the razor blade towards the frame to reduce those chances. Installed sun screen on the kitchen window. And now we can finally leave the blinds open in the evening, without being blinded by the sun in the early evening! 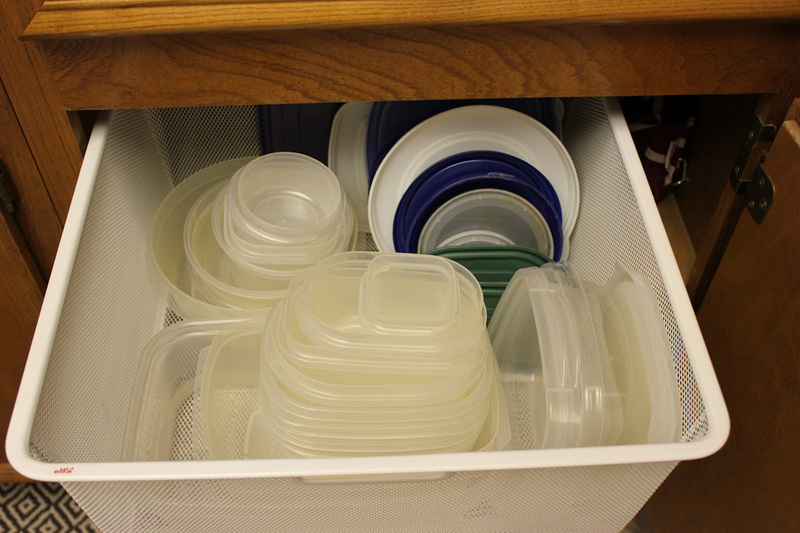 This weekend I took care of another exciting house project – organizing our plastic container storage! The Container Store had just the thing, an elfa basket that be installed in a cabinet on a track so that you can pull it out of a cabinet for easy access. 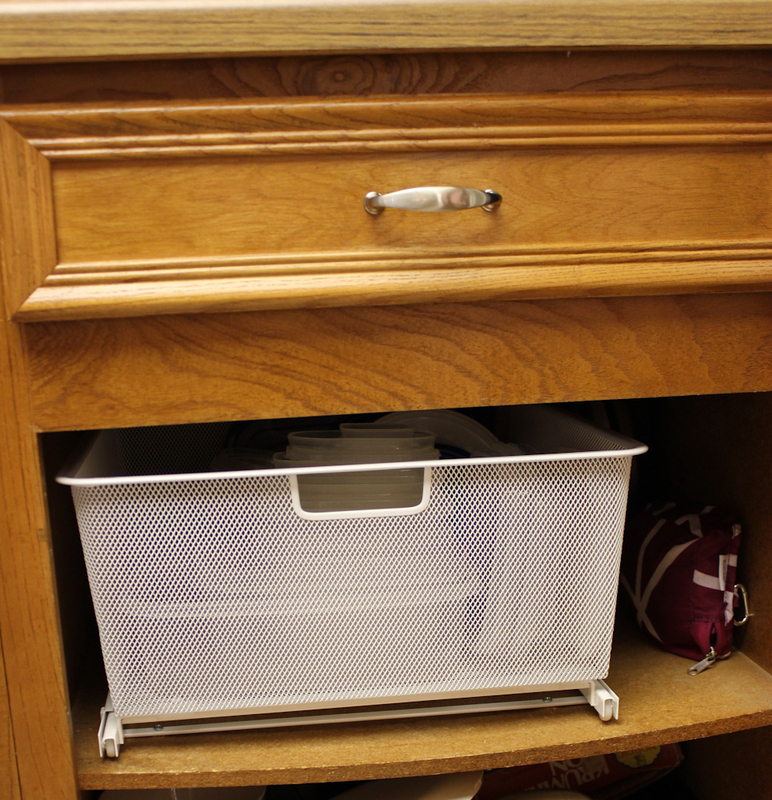 You can also easily lift out the basket to get at anything you have stashed in the very back of the cabinet. Elfa drawer, installed in the cabinet. 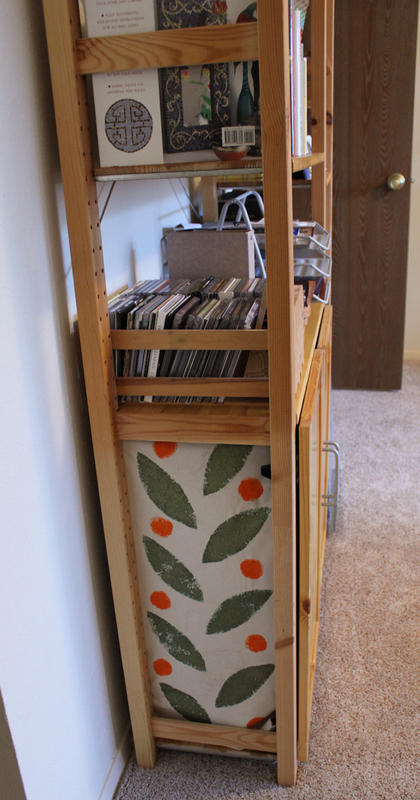 Yes, that shelf is kind of warped, but the basket frame still works as designed. Elfa drawer, pulled out with plastic containers nicely organized. I was wandering through Joann Fabrics not too long ago with an extra 40% off coupon in my pocket when a short little wooden foot stool caught my eye. Ever since moving into the new house, I’ve wanted something to help me reach the top shelves in the pantry without having to drag out our folding step stool. I quickly brought the foot stool home with me and got to work finishing it. 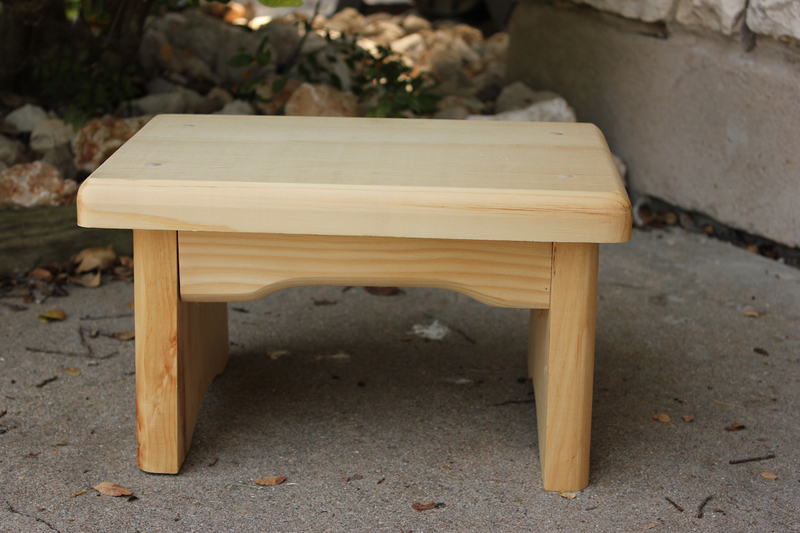 Raw wood foot stool from Joann Fabrics. From previous painting projects, I have a ton of paint samples in a variety of colors. I decided to use those samples to paint my stool. 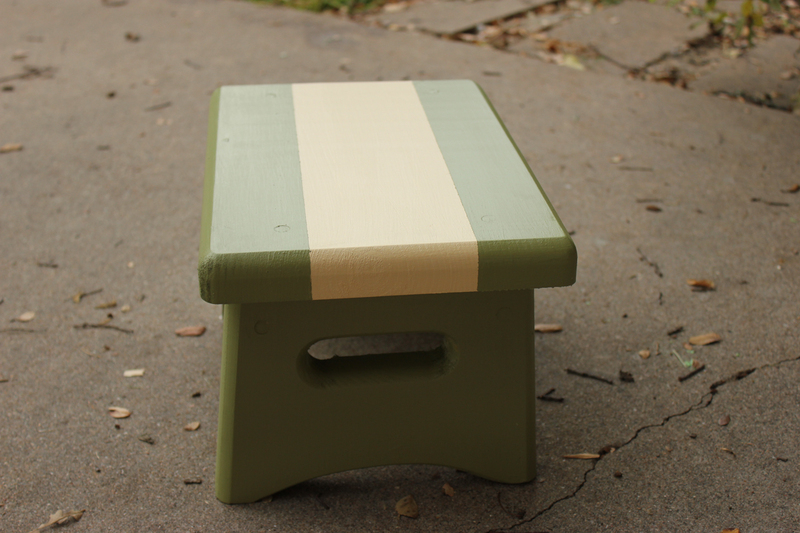 I wanted to make it two colors, so I painted a stripe down the top of the stool in yellow, and the side supports underneath. 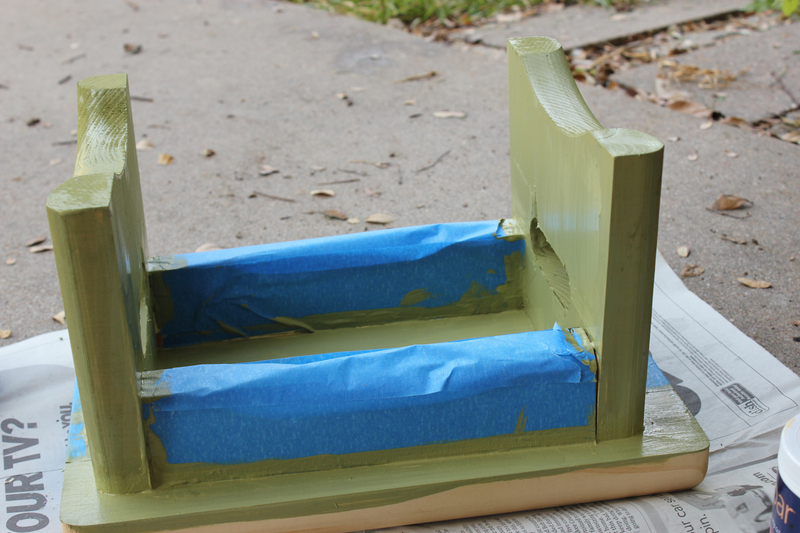 After two coats dried, I taped over those parts so that I could paint the rest of the stool green. Yellow paint is under the blue tape. Getting ready to paint the top. 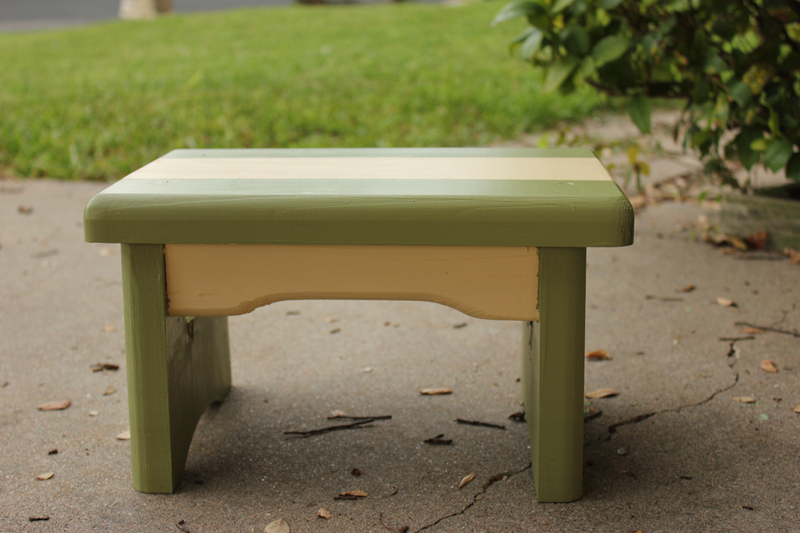 After two coats of green were complete, the stool was ready! I had to give it extra drying time because of the humidity here – the paint felt tacky for a while but eventually the tackiness went away. 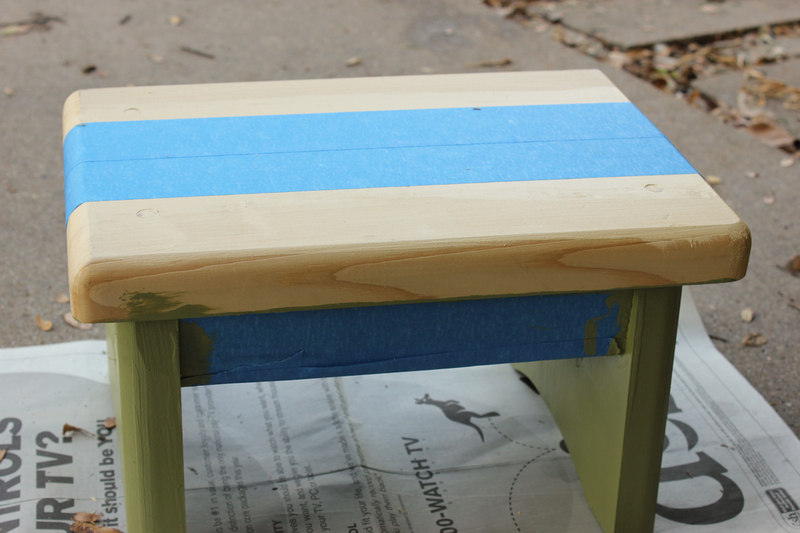 I added stick-on rubber pads to the feet to keep the stool from leaving scraped off paint on the floor. The stool lives in our pantry, ready to spring into action and help me reach items on the top shelves. Ok, so the title is a little misleading. It’s really OUR craft and computer room and we had a similar room in our previous house. The exciting news today is that after a few months in our new house, the craft room is finally unpacked and ready for use! And it is huge… it has all of the furniture from the last house, plus our old couch bed (and room to spare). We had a long delay with unpacking the room because of our cats. 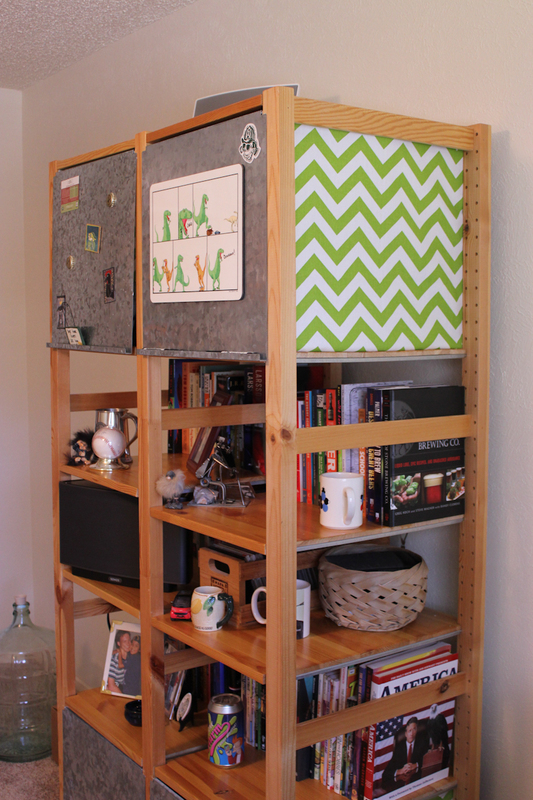 We decided that we needed to protect our raw wood Ikea Ivar shelving units from their fur. Since the shelves were unfinished, cat fur stuck to them and was impossible to get off. So we took the time to sand all 25 shelves and two cabinet doors and apply three coats of Minwax fast drying polyurethane. It took awhile. When we first installed our Ivar units in the previous house, we need to have some amount of hidden storage for office and craft supplies and all those other things that would look silly just left out somewhere. 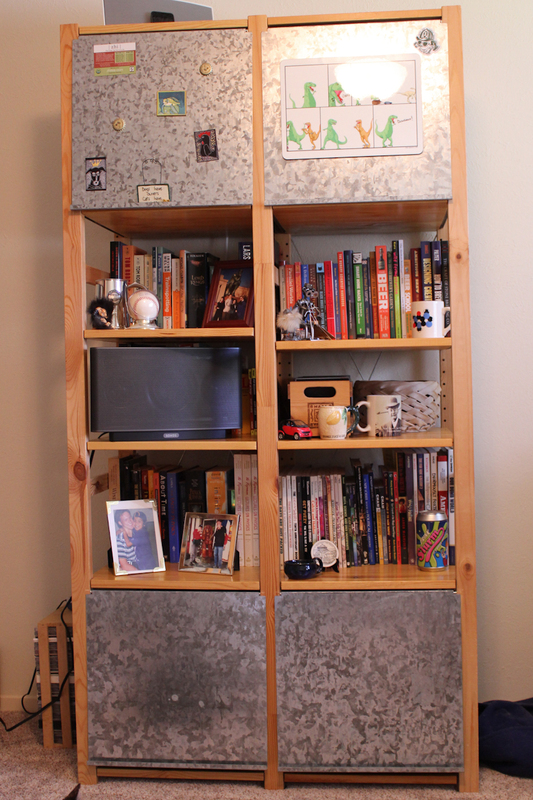 To create hidden storage, we have some galvanized metal doors and wood cabinet doors. However, Ivar does not come with anything to enclose the sides of the unit, so when we installed the doors I knew I needed something to cover the sides so people couldn’t see the messes we were hiding. 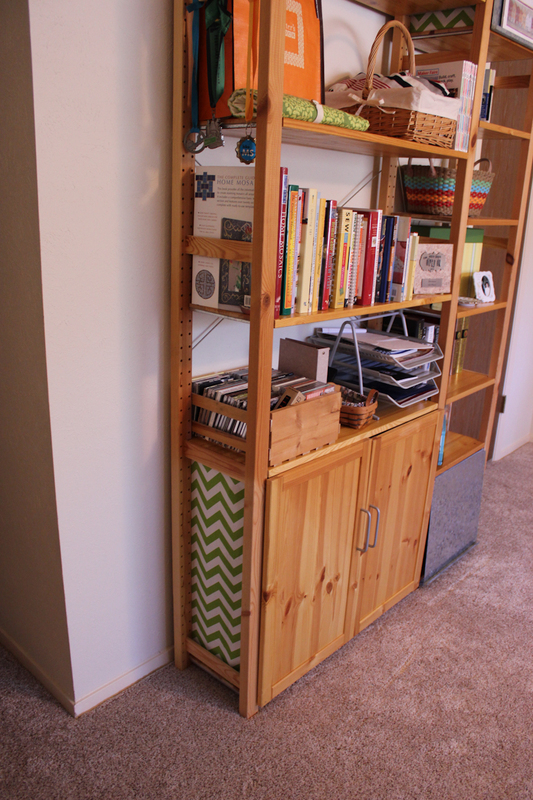 The tall thin shelving unit, mostly dedicated to crafts. 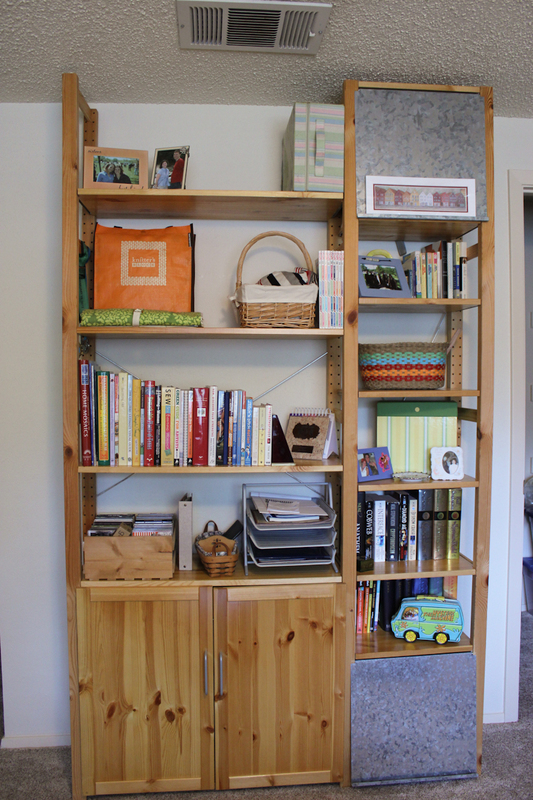 The shorter shelving unit, mostly dedicated to books and office supplies. At that time, I decided to use plain canvas cloth and print it with sponge stamps I made myself. It was a good idea, but I’ve not been entirely happy with the execution. Side of the cabinet with hand printed canvas. Side of the office supply cabinet. 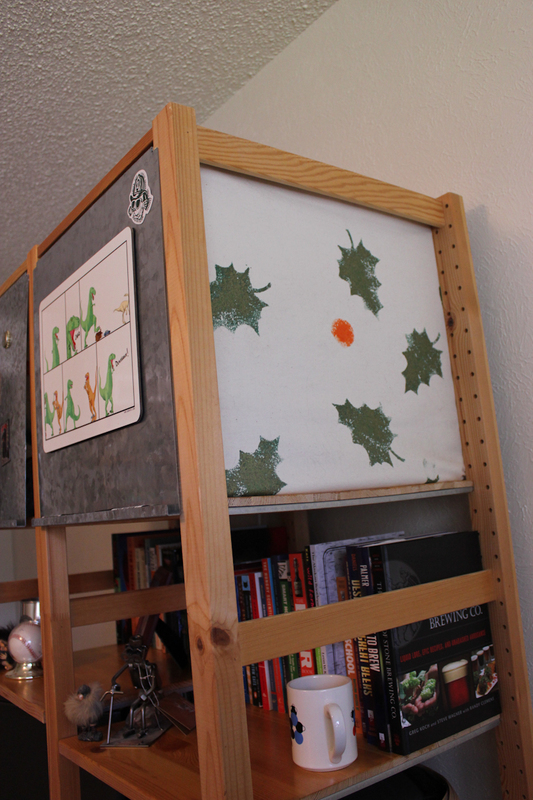 Since we were taking the time to upgrade the shelves with polyurethane, I decided to also upgrade the fabric. After a misguided decision to try to make my own chevron pattern fabric starting from canvas again, I quickly realized I could buy chevron home decor fabric on Etsy. A few days later, it arrived in the mail. 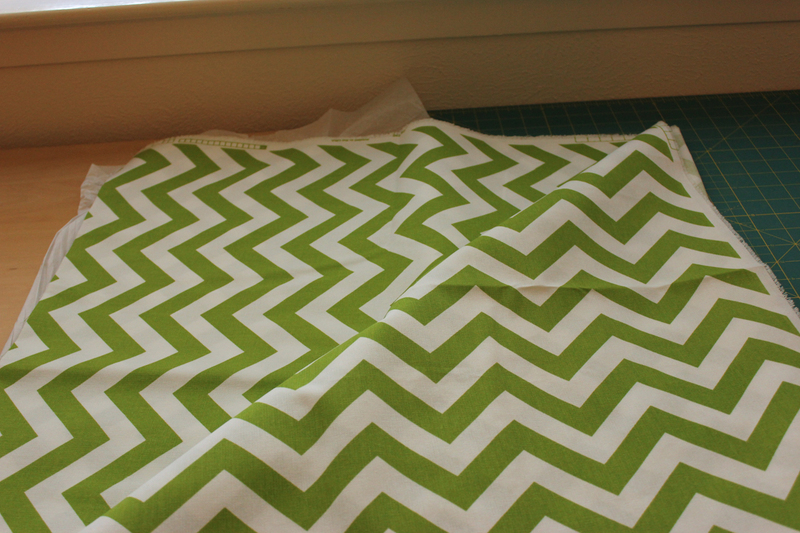 Chartreuse home decor chevron fabric. I then started the somewhat frustrating process of prying all of the staples out of the shelf supports. I tend to get a little staple gun crazy sometimes. 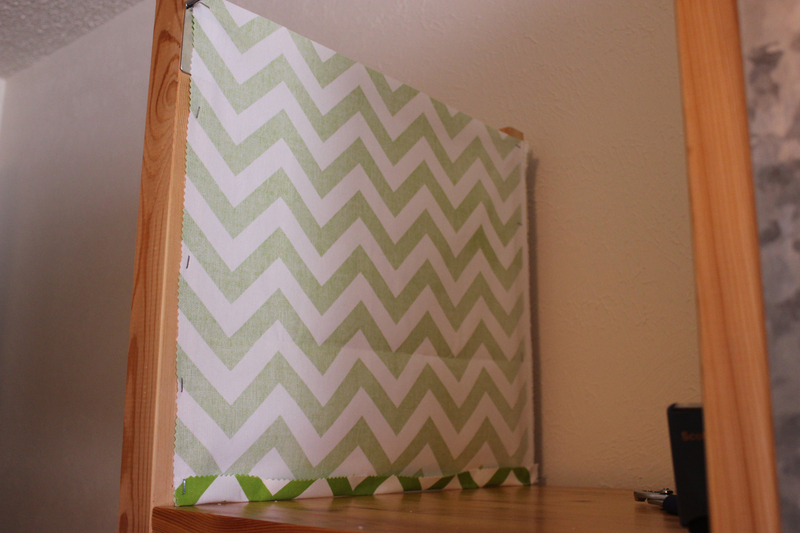 After taking out the old fabric, I used it as a template to cut a piece of the chevron fabric. To keep the fabric from unraveling and so that I didn’t have to do any sewing, I used pinking shears to cut the fabric. I stapled the fabric to the sides, the bottom shelf (so nothing can fall out) and any wood supports that happened to be positioned at the top or bottom of the fabric. My arm sure is sore now after prying out staples and then maneuvering the staple gun over my head. I’m pretty short so some of these shelves were hard to reach. The new fabric makes the craft room stylish. The other stylish shelf unit. A view of both shelves. 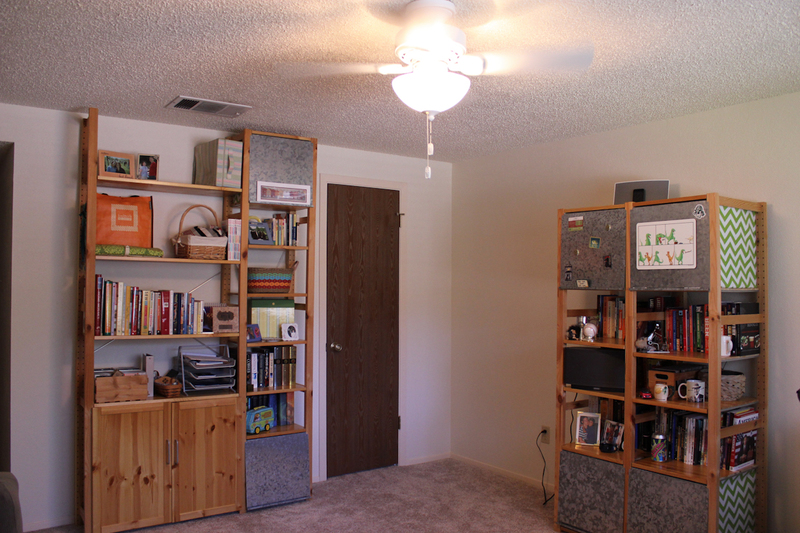 Someday we’ll get around to personalizing this room… painting the walls, hanging decorations, adding curtains or a valance, replacing the tiny little white fan… and so on.